Despite the snowstorm in Tennessee we were able to get out in Campbell County this afternoon. Our road crews worked super hard to get the main roads and Hwy. 25W cleared. The roads were a lot better than I'd even anticipated. 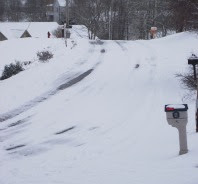 Getting to the main road from the subdivision was a little dicey. After that, out travel went really well. We drove down Hwy. 25W into Caryville from Jacksboro. On the way, we decided to stop by Cove Lake State Park. The snowstorm in Tennessee closed parts of the park. That didn't keep the kids from sledding in the parts of the park that you could get to. We even ran into one of our friends who was out for his daily jog! Here are more photos of Jacksboro and Caryville that you'll enjoy. This photo is the road in front of my house. It was taken today at about 3:30 pm. Getting to the main road was pretty interesting. Here we are on Hwy 25W. I love our road crews! They did a fantastic job! 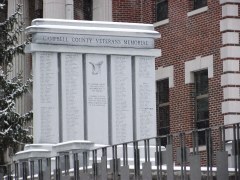 Here's the Veteran's Memorial in front of the Campbell County Courthouse. Every time of year is a good time to visit this monument. I think that it looks especially dignified in snow. Hopefully, most of the major roads in the county will be navigable by tomorrow. I always enjoy taking snow photos of our area. It's truly one of the most beautiful areas of the country.